Huber Introduces Granite Elite® Infinity™ Series at CAMX! 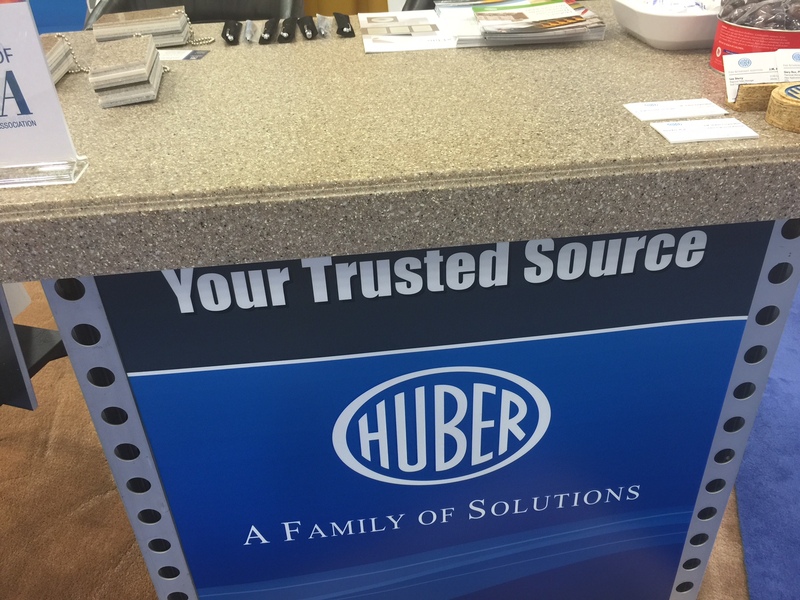 Huber’s booth kiosks at CAMX in Dallas are covered with custom made Granite Elite® Infinity™ Series countertops. At The Composites and Advanced Materials Expo (CAMX) event this week in Dallas (Texas), Huber Engineered Materials proudly introduced and launched its Granite Elite® Infinity™ Series of colors. This new series of modern two-dimensional colors features a high chip concentration appearance with the flexibility for manufacturing cultured granite or solid surfaces in thin or thick parts that can be made into shapes or sheets. The colors introduced include Earth, Shadow, Purity, Moonstruck, Saturn and Cosmos. Huber’s Granite Elite is a precision formulated, ready-to-use mixture used to manufacture cultured granite and solid surfaces in the production of kitchen and bath surfacing materials and shapes including sinks, bowls, bathtubs and shower bases. 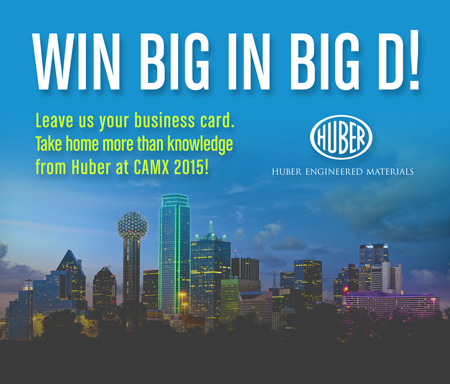 Great Start in Dallas for Huber at CAMX! It’s been a delightful Tuesday in Dallas for Huber Engineered Materials as The Composites and Advanced Materials Expo (CAMX) kicked off at the Kay Bailey Hutchison Dallas Convention Center. We’ve already had the pleasure of interacting and visiting with a number of attendees at booth X74. The booth was bustling with activity from the start as we’ve welcomed a steady stream of guests throughout the day. As the event continues into Wednesday and Thursday of this week, you are cordially invited to stop by our booth. We are looking forward to seeing you soon in Dallas! Win Big in ‘Big D’ This Week! We are looking forward to this week in Dallas (Texas), as we exhibit at The Composites and Advanced Materials Expo (CAMX) at the Kay Bailey Hutchison Dallas Convention Center. You are welcome to stop by Huber’s booth locations at X74, as we discuss our high performing halogen-free flame retardants and smoke suppressants, ground calcium carbonates and cast polymer performance materials for a variety of composites applications. As an added bonus, you can take more home than just knowledge from Huber at CAMX. We will be holding daily giveaways, so stop by our booth, simply drop off your business card, and you could be a winner. You don’t even have to be present to win. It all starts tomorrow, Tuesday, Oct. 27. See you soon in Dallas! HEM Set to Exhibit in ‘Big D’ for CAMX 2015! Big D, here we come! That’s right, Huber Engineered Materials is looking forward to spending three days this next week in Dallas (Texas) at The Composites and Advanced Materials Expo (CAMX): Tuesday, Oct. 27 from 10:30 a.m. until 5 p.m.; Wednesday, Oct. 28 from 9 a.m. until 6 p.m.; and Thursday, Oct. 28 from 9 a.m. until 1 p.m.
We cordially invite you to stop by booth X74 in the Kay Bailey Hutchison Dallas Convention Center to say hello and learn more about our halogen-free flame retardants and smoke suppressants, ground calcium carbonates and cast polymer performance materials for a variety of composites and cast polymer applications. Huber personnel always looks forward to meeting with customers, prospective customers and friends at trade show events like CAMX. See you soon in Big D! It’s All Ohio This Week! Huber Engineered Materials is pleased to be in two great Ohio cities this week exhibiting at key events! At the International Elastomer Conference and Rubber Expo Oct. 13-15, we will be in booth 124 at the Cleveland Convention Center showcasing our precipitated silicas and silicates and halogen-free fire retardant additives for a number of rubber-related applications. During those same days, our team will be handling tabletop #17 at the SPE Vinyltec Conference at the Hilton Akron Fairlawn Hotel and Suites in Akron discussing our high performing ground calcium carbonates and non-halogen flame retardants and smoke suppressants for flexible and rigid vinyl. We always enjoy the opportunity to get out and visit live with customers, prospective customers, distributors and friends. We cordially invite you to stop in and see us as we are set to enjoy the state of Ohio this week!